A BUTTONS frame, fixed at the top of the page. A MAIN frame, containing the user form. A POP-UP window, containing the results of your ESPript job. Fill up the form by, at least, uploading a multiple alignment file in the section Aligned Sequences . PDB files and DSSP files can be uploaded in the section Secondary structure depiction . The rest of the form allows you to change parameters related to the secondary structures and sequence similarities depiction as well as the alignments output layout or the size and format of the resulting figures (PostScript, PDF, PNG, TIFF). All these options are detailed in the User Guide section or directly from the interface by clicking on the icons. Only yellow buttons are active at the exception of the TIME bar. Blue buttons are not clickable. When the main form is filled, click on the SUBMIT button to let ESPript process your query. A result pop-up window automatically appears within seconds. This results window can be (re)opened at any moment by clicking on the RESULTS button. In order to access the results, you may be required to authorize your browser to display pop-up windows from espript.ibcp.fr. If needed, please refer to your browser documentation. The DOC button displays the full User Guide in a separated window. Click on ADV (ADVanced) or EXP (EXPert) to have access to more options. The default mode is BEG (BEGinner). In ADV mode, you can introduce another secondary structure file, change labels of secondary elements, fiddle with special characters and calculate similarity scores between groups of sequences. In EXP mode, you can also define your own colors, shift sequence numbering, etc. You can navigate between BEG , ADV and EXP modes without losing information in your query. If you are in ADV or EXP mode, you can use the +1 button to build a layered ESPript figure. If you click on +1 , a new layer is created (up to 20 layers can be defined). The parameters specified for Layer 0 (i.e. the first one) are copied to Layer 1 (and so on). Button -1 allows the user to suppress the last created layer. Layer Common contains parameters shared in all layers. You can switch between the different layers by clicking on the tab bar (see below). Check example #3 to learn more on this option. Use the SAVE button to save your session on your computer, so that you can use later the same parameters and files. Use the LOAD button to load a previously saved session. Pay attention to the TIME bar. You must at least execute one command each 60 minutes otherwise you session will be closed. Before leaving, click on the EXIT button so the processing and results files are permanently removed from server. Figures produced by ESPript appear in this multi-tab window with dedicated links. Click to visualize them or click with the right button of the mouse for retrieve. Expert (or curious!) users can click on the Server logs Input files or Tracing files tabs to access the corresponding reports and data. Session vp7_beg.sav for beginners (resulting PDF, PostScript, PNG). Sequences homologous to vp7_btv10, a viral protein whose 3D structure has been solved, have been aligned with ClustalW. Save the alignment file vp7.aln on your disk, and upload it in the first section Aligned Sequences of the form. SUBMIT and open the resulting image. A column is framed in blue if more than 70% of its residues are similar according to physico-chemical properties (threshold is set to 0.7 in the section Sequence similarities depiction parameters of the form and the button %Equivalent is activated). 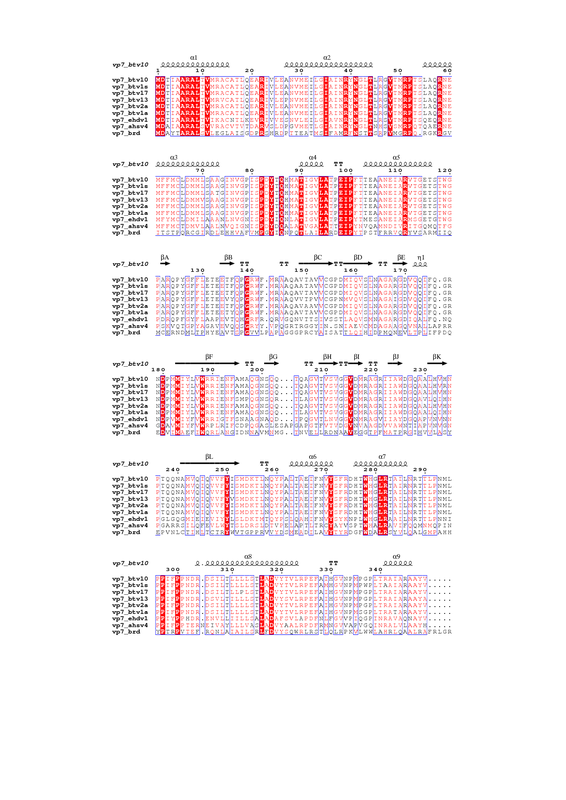 Note that vp7_btv10 is the second sequence in the alignment. Save the PDB file vp7_btv10.pdb on your disk and upload it in the second section Secondary structure depiction of the form. SUBMIT and open the resulting image. 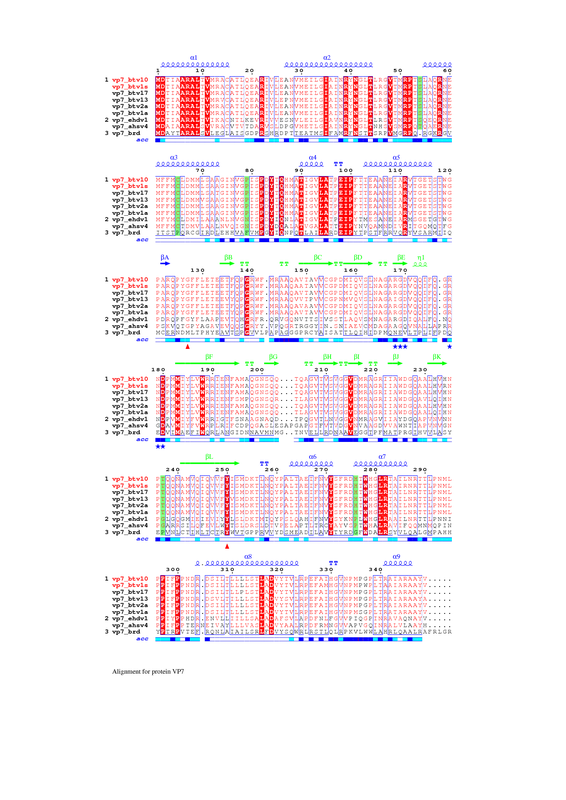 Observe that the secondary structure elements displayed above sequence blocks are named vp7_btv1s. This is normal: by default they are aligned with the first sequence displayed by ESPript, here vp7_btv1s. However, this is wrong: your secondary structure elements refer to vp7_btv10. Browse the form to the section Defining groups . Change the string all to 2 all. SUBMIT and open the resulting image. vp7_btv10 is now the first displayed sequence and secondary structure elements are correctly aligned with it. Check the section Alignments output layout . You will see a yellow tooltip indicating "Suggested number of columns: 60 (for A4, portrait and a font size of 7)". This indicates the Number of columns to set in order to obtain a justified figure. Session vp7_adv.sav for advanced users (resulting PDF, PostScript, PNG). This session uses the same ClustalW alignment as in Example #1. You can start with the session vp7_beg.sav decribed above. LOAD previous session by using the buttons frame. SUBMIT to check if everything is fine. Click on ADV to access new options. Check the button Relative accessibility in section Secondary structure depiction of the form, to show accessibility per residue with a blue bar below sequence blocks on the image. Click on Hide names in the same section, to remove the string vp7_btv10 above sequence blocks, at the same line as secondary structure elements. Type the command U R 127 250 in section Special commands and characters , to add two red triangles below residues 127 and 250 of the first displayed sequence, vp7_btv10. These triangles show the separation between an α-domain (1-127, 250-349) and a β-domain (128-249) in the 3D structure. X B 1-126 254-349 to color secondary structure elements of the α-domain in blue. X G 127-253 to color secondary structure elements of the β-domain in green. T R 1 2 to color in red the names of the first and second diplayed sequences. Note: you must press [ENTER key] after each line of special commands. Type in subsection Footnotes of Alignments output layout the sentence: Alignment for protein vp7. In section Defining groups , delete 2 all and type 2 1 3-6 7-8 [ENTER key] 9 in order to define three groups of sequences according to phylogeny (the first group is made of btv sequences only) and to calculate in-group as well as cross-group similarities. This necessits the use of a scoring matrix, and the option Risler is selected instead of %Equivalent in section Sequence similarities depiction parameters . At column 1 that all residues are identical and are boxed in red. At column 10 that residues of the first group are identical and are in red (all threonines) and that those of the second are similar (threonine and serine) and are in red ; the third group is made of a single sequence and the residue is in black. The global similarity score calculated from all groups is > 0.7 (which is the threshold entered in the section Similarity Calculation ) and the column is framed in blue. At column 19 that residues are not framed, the global similarity score being < 0.7. Moreover, residues of the second group are in black, because they are not similar (lysine and threonine) according to a in-groups score < 0.7 (the same threshold is used by the program for global scores and in-groups scores). At column 79 that the column has a yellow background. Residues are similar in each group (in-groups scores > 0.7) but significantly different from the first group (all prolines) to the second (all histidines). Thus, the cross-groups score is > 0.5, which is the current threshold according to the section Sequence similarities depiction parameters . Select option Thermal in section Alignments output layout to obtain bold characters. Type the command M Y all in section Special commands and characters to add a yellow background on similar residues. Session vp7_exp.sav for experts (resulting PDF, PostScript, PNG). Again, same CLustalW alignment, but information on the 3D structure of vp7_btv1s is now entered. The button +1 of the buttons frame is used for this purpose. The following must be generated in ADV or EXP mode. We will start from scratch. 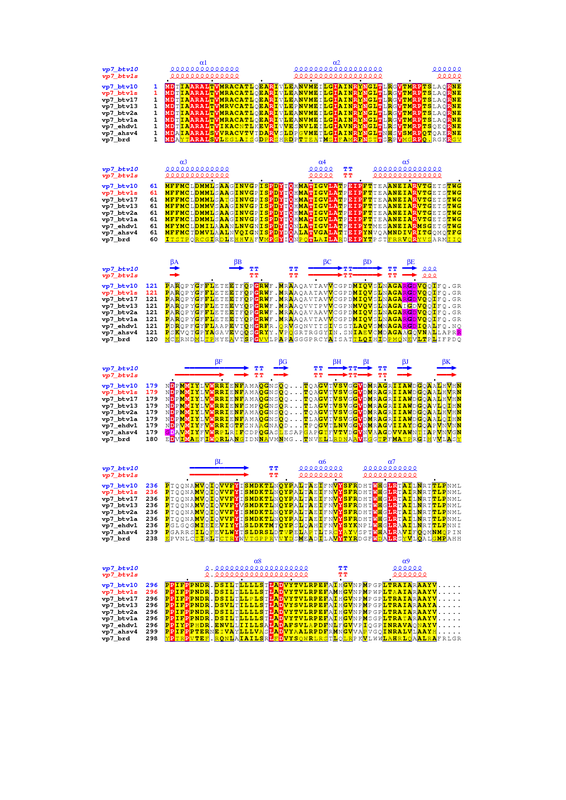 Upload vp7.aln in the section Aligned Sequences . Upload vp7_btv10.pdb in the section Secondary structure depiction . Type X B 1 in the section Special commands and characters , to color in blue secondary structure elements and align them with the first displayed sequence. Type h in subsection Replace secondary structures labels of Special commands and characters , in order to remove the label h1 from the 310-helix. Change all to 2 all in the section Defining groups to display vp7_btv10 as first sequence in the alignment. SUBMIT to check the result. Click on Hide sequences in the first section and SUBMIT again. Only secondary structures elements are now displayed. Click on +1 in the buttons frame to create a new layer. The form now contains two independant layers named Layer 0 and Layer 1 and a shared one ( Common ). Check that the alignment file vp7.aln has been copied from Layer 0 to Layer 1 . → All following commands must be entered in Layer 1 . Disable option Hide sequences , then enter a Vertical shift of -1 in section Alignments output layout . SUBMIT to check. You now have a gap between secondary structure elements of vp7_btv10 and sequences. Upload the vp7_btv1.dssp file in the section TOP secondary structures of the box Secondary structure depiction , which corresponds to vp7_btv1s. Type X R 2 in the section Special commands and characters , to color in red secondary structure elements and align them with the second displayed sequence. Type 2 all in the section Defining groups . → Information on secondary structure elements are well aligned with sequences but labels of vp7_btv1s need to be removed. Click on Hide labels in section Secondary Structure . → All information is now well displayed. We will add extra boxing on residues. Type Q P 1-3 169-171 in section Special commands and characters . This means that columns 169-171 of sequences 1-3 are boxed in pink. Note that the program uses columns numbering instead of residues numbering for the special commands Q, V and W. You can visualize columns numbers by checking the button Ruler in the same section. Type Q P 5-7 169-171 [ENTER key] Q P 8 180-182 in the same section to box all RGD tripeptides. Select the mode Flashy in section Color scheme of the Common tab to add a yellow background on similar residues. → We will now color sequence names of vp7_btv10 and vp7_btv1s. Type in the same section Special command and characters . T B 1 to color the name of the first displayed sequence in blue. T R 2 to color the name of the second displayed sequence in red. → Finally, we will number all sequences. Click on Number sequences in section Aligned Sequences of Layer 0 . The three examples above refer to figures prepared in the group of Prof. David STUART, Division of Structural Biology, Oxford.